Earth is surrounded by two huge regions of charged particles like protons and electrons, and these areas are known as the Van Allen radiation belts. These belts can mysteriously change their intensity, posing a threat to astronauts and sensitive electronics. To get to the bottom of what makes the Van Allen belts tick, two experiments will soon commence. The first is NASA's Radiation Belt Space Probes, which will place two satellites into space right above the equator. This RBSP mission will then observe the charged particles that move along the magnetic lines down towards the poles. The hope is that this careful observation will validate one of the many theories that seek to explain why the Van Allen belts wax and wane in intensity. At the same time, Dartmouth physicist Robyn Millan is heading up Balloon Array for RBSP Relativistic Electron Losses, or BARREL, which will measure the X-rays created when charged particles reach the end of the magnetic lines down at the poles. To do this, the BARREL team will launch balloons into the sky high above Antartica, where they will be able to observe the particular properties of the charged particles and X-rays than has been possible before. RBSP and BARREL can work together to hone in on the most promising clues as to the inner workings of the belts. "Probably the most interesting thing to me about the radiation belts is how variable the region is. During geomagnetic storms, we see charged particles accelerated to really high, relativistic energies, traveling near the speed of light. The number of these particles can increase by a factor of 1,000 in a day or less. We don't often think of Earth as being an efficient particle accelerator like exotic objects such as black holes or supernovae, but it is, and it is right in our own backyard, so we can really study the processes in detail. Equally as exciting as the particle acceleration are the rapid depletions of the radiation belts that we observe. 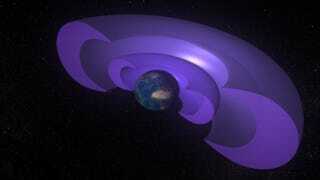 The entire radiation belts can nearly disappear in the matter of a day or even less." For a more detailed explanation of NASA's plans, check out Space.com.